Today I slit my wrist. It was a deep cut that ran vertically, as prescribed by those who think about how best to cut your wrists. However, it wasn't on purpose. I dropped a bottle of French cider (I am sad about this) that exploded on impact and somehow slashed me as it did. I was worried about the location and depth of the injury (arteries and all that), so I went to emergency [which is only a few hundred metres from my house] accompanied by my son. After the adrenaline rush wore off I realized a minor wound such as mine would not make it to the front of the queue for about 12 hours so I left and went and bought some appropriate bandages. I will probably live, unless the Gods have some other fiendish plan for me tonight. But just now, several hours later, I have discovered that my watch (which I took off quickly so I could wrap my bleeding wrist) is broken. I realize now that the short wound stops exactly where my watch started. 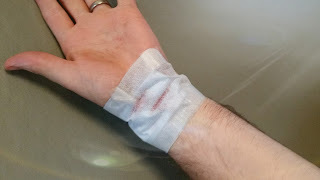 So perhaps the fact that I was wearing a watch stopped a slightly serious wound from being a much more serious wound.